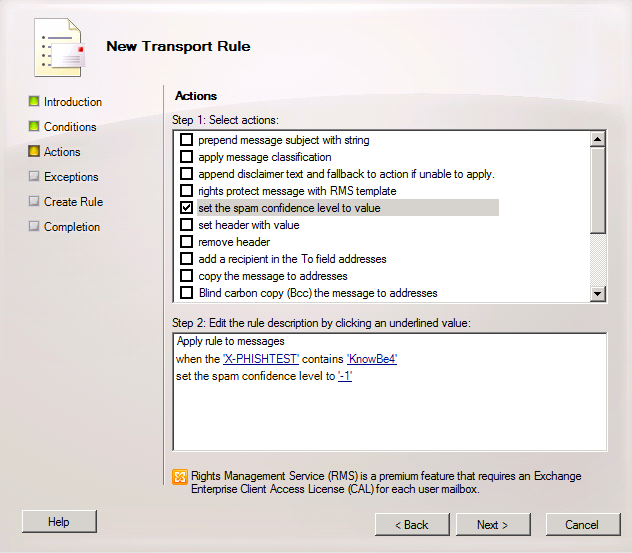 This document will cover how to allow our simulated phishing emails to reach your users by whitelisting by email header in your Exchange 2010 environment. Whitelisting is necessary in order for us to send simulated phishing emails that will bypass your mail filter. Typically we recommend whitelisting by IP address or domain. But depending on your system set-up (for instance, if you're using a cloud-based spam filter), whitelisting by headers may be the most suitable way to ensure phishing test emails are delivered to your users. Make sure you also whitelist our IPs in your spam filter. 1) Open your Exchange Management Console (EMC). 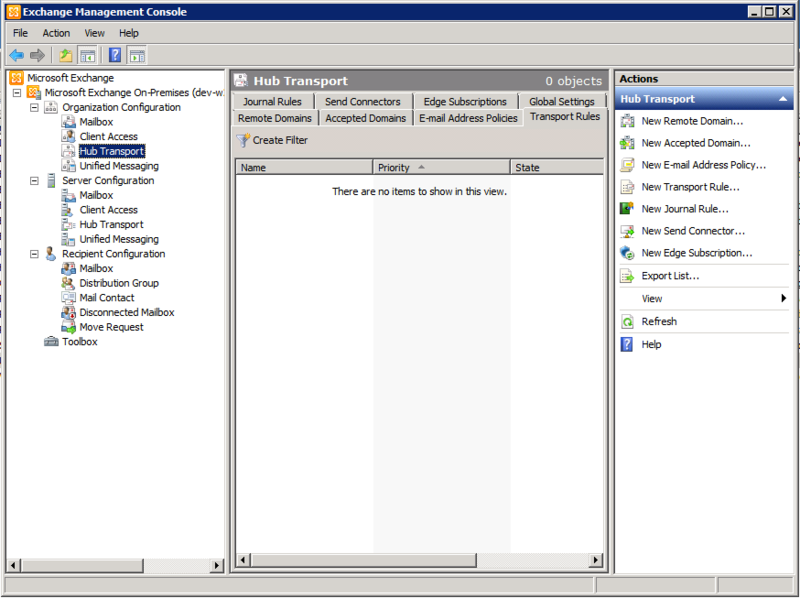 2) Expand Organization Configuration on the left-hand side, and click Hub Transport. 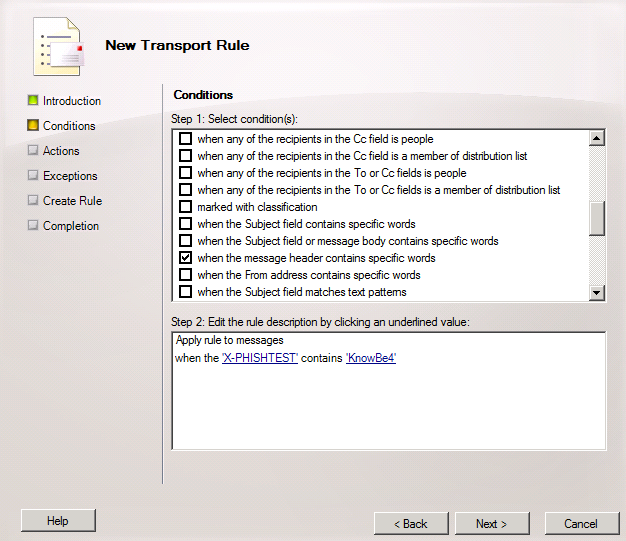 3) Under Actions on the right-hand side, select New Transport Rule. 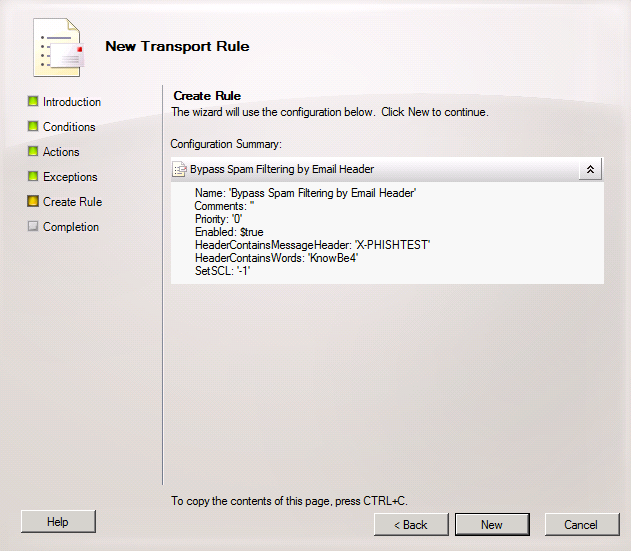 4) Enter a name for your New Transport Rule, such as "Bypass Spam Filtering by Email Header", and click Next. 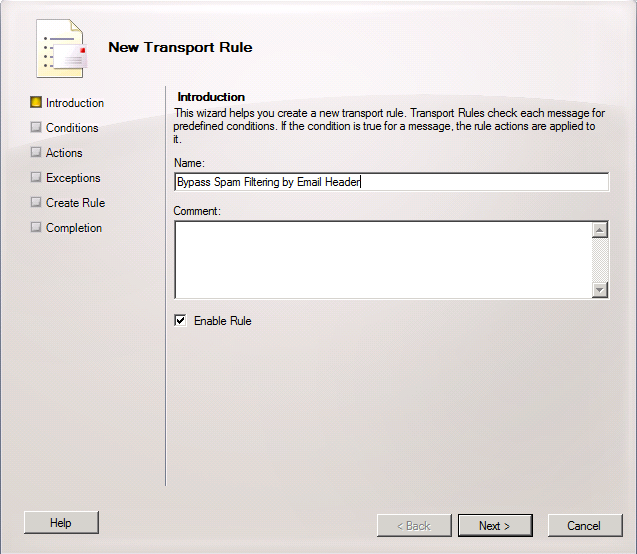 5) In Step 1, select condition "when the message header contains specific words". Beneath Step 2, complete the following steps. a. Select message header and type in the header "X-PHISHTEST". b. Select specific words and then enter "KnowBe4". 6) In Step 1, select action "set the spam confidence level to a value". In Step 2, set the Spam confidence level (SCL) threshold to -1. Click Next. 7) Click Next to create rule, then select New to continue. My Organization Uses Mimecast. Can I Still Send Phishing Tests to My Users?